Today we celebrate our 25-year jubilee. We are TOS. A family business. Loyal and authentic. Founded in 1992 in Rotterdam. Today, twenty-five years later, a reliable maritime services provider. Connecting people from around the world, supporting and empowering them to find pleasure in their work. #TOS25YEARS: SHARE WITH US YOUR STORY AND WIN! Celebrate with us our 25-year jubilee. What is your story? How many years have you already been part of our TOS family? Which voyage or project was most memorable for you? Did you start your career at TOS or did you join our company as a seasoned professional? We’d love to hear your stories and see your pictures.  Your contribution will be displayed on our renewed website. Enjoying your time off is important. Lounging around at home with your family. These exclusive bathrobes are sure to help you relax and unwind after a long voyage or project for TOS. Getting you ready for your next adventure: two exclusive Mr & Mrs bathrobes stitched with your name on the back. The book is called “The port of Rotterdam from above” and written in both English and Dutch. The port has grown from east to west – from the Van Brienenoord bridge all the way to the North Sea Dyke of Maasvlakte II – and that is also how this photo book has been arranged. With 25 years of stories and experiences… we could almost write a whole book! 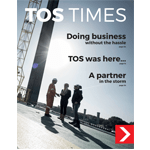 With the TOS TIMES magazine, we don’t want to dwell on the past, but instead to look ahead to the future of TOS. We zoom in on the current challenges, projects, and market developments: from unique ship deliveries to offshore wind and maritime projects; and from decommissioning to the changing international laws and regulations. We are proud of our roots and even more proud of the TOS of today. Click here to download our corporate magazine.